The end of the semester is near and graduation is right around the corner! Seniors are now pressured to lock down future plans for the next chapter of their lives. Whether your goal is starting a career, an internship, or graduate school, this is a very important time to mold your brand and prove your worth. The image you portray is vital, you need to market yourself in a way that is unique and shows that you will be an important asset to the team. Thanks to our Communication Capstone course, students can prepare and shape their resume and artifacts for their portfolios. Why not make an online portfolio? In this day and age, in almost every field an online presence is essential. I am going to show some advantages of making your own online portfolio. As we all know, the moment an employer decides someone is worth hiring, they Google the prospect to gather as much information as possible. Facebook, Twitter and other social media is a great way for an employer to size someone up. But, if your online portfolio is the first thing the employer sees this can be beneficial to you by making you appear professional while showcasing your work. It shows employers you have taken the time and initiative to collect artifacts such as past articles, blogs, projects and presentations. Online portfolios give you the opportunity to show the steps and improvements you have made within projects. Including future goals is something that employers would like to see as well. The ability to personalize the layout and design gives you the opportunity to perfect your brand image exactly how you would like to present yourself. Maggie O’Briant’s article, 5 Great Online Portfolio Hosting Websites, claims that carbonmade, behance, photoshelter, dripbook, and viewbook are all great opinions when choosing the host site that is right for you. Maggie also describes the details of each of these listed sites in her article if you would like more information. An online portfolio is the ideal tool to create brand coherence for yourself. In the book Branded Nation, James B. Twitchell defines brand coherence as “a sense of coherence, a sense that nothing was out of place, a sense of a center”. This will give your audience a clear image and a centered sense of who you are. The best part is you have the ability to control your image, by editing your portfolio at anytime. Twitchell also states that a brand tells a story. Creating this profile offers you a platform to display the story of YOU, how you have evolved, and where you would like to go. Interesting post Kelsey. For your information my COM 400 students this semester had to evaluate various sites for on-line portfolios. Of the four groups that have presented at this time three found that Wix was the best option, and one liked WordPress for their portfolios. I have used Google sites in past classes and it is a great option for everything but students that need to upload video. The one comment about behance that was made was that it was to artsy for a professional portfolio. I think that creating an online profile is a very good idea. It is a one-stop shop for everything “you”, all in one place for your prospective employers’ convienence. How could it do anything but improve their impression of you? Unless of course you don’t have it up to date or the quality of your work isn’t as high as it should be. But as UNCW COM majors, we all know better upon graduation. I think that the idea of an online portfolio is great. However, I know some of the capstone classes are shifting towards a digital portfolio rather than a hardcopy portfolio. I think online portfolios should be used in addition to a hardcopy portfolio rather than serving as the main way you showcase your work. Having a hard copy makes things easier during the interview process because you have something tangible right in front of you to discuss and show to your potential employers. I’m also noticing the trend of LinkedIn, which I think is a great way to market yourself. It’s so easy to get yourself in trouble via social media in the job market so being conscientious of this may put you at an advantage against others. As an upcoming graduate, I really love the idea of an online portfolio. Not only is it an easy way to create a porfolip for your future employers, it makes it unique and it’s a great way to save paper (go green!) As we have talked a lot about “brand personality” in IMC class, it is very important to be able to portray thay through your portfolio. 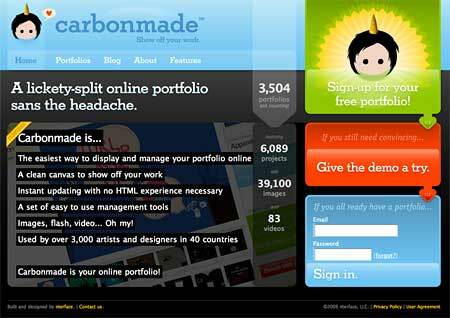 These websites not only let your portfolio shine but also your layout do some of the talking.